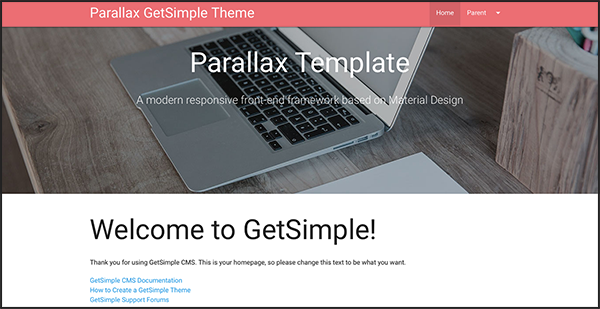 Multipurpose GetSimple theme based on the parallax template by Materialize. By default this theme uses the standard Materialize color scheme. The ParallaxCustomizer plugin allows you to change the color scheme to white, blue, teal, red, or earthy. The plugin also allows you to change parallax images by simply specifying an image url in a textfield. If you want to hard code other color schemes, simply add the appropriate color class. More information on available Materialize color schemes and classes here. Materialize also comes with a variety of google icons. More information on icons here. Install this theme just like any other getSimple theme. Download, unzip and upload to your web server.